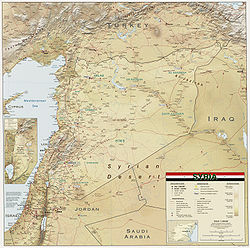 Syria is located in Southwestern Asia, north of the Arabian Peninsula, at the eastern end of the Mediterranean Sea. It is bordered by Turkey to the north, Lebanon and Israel to the west and southwest, Iraq to the east, and Jordan to the south. It consists of mountain ranges in the west and a steep area inland. In the east is the Syrian Desert and in the south is the Jabal al-Druze Range. The former is bisected by the Euphrates valley. A dam built in 1973 on the Euphrates created a reservoir named Lake Assad, the largest lake in Syria. The highest point in Syria is Mount Hermon (2,814 m (9,232 ft)) on the Lebanese border. Between the humid Mediterranean coast and the arid desert regions lies a semiarid steep zone extending across three-quarters of the country, which receives hot, dry winds blowing across the desert. Syria is extensively depleted,[clarification needed] with 28 percent of the land arable, 4 percent dedicated to permanent crops, 46 percent utilized as meadows and pastures, and only 3 percent forest and woodland. ^ Research Divi Federal Research Division, Federal Research Division (2004). "Land, Water and Climate". Syria a Country Study. Kessinger Publishing. p. 74. ISBN 9781419150227. Jordan is situated geographically in Southwest Asia, south of Syria, west of Iraq, northwest of Saudi Arabia and east of Israel and the West Bank; politically, the area has also been referred to in the West as the Middle or Near East. The territory of Jordan now covers about 91,880 square kilometres (35,480 sq mi). Lebanon is part of the Middle East, located at approximately 35˚N, 35˚E. Stretching along the eastern shore of the Mediterranean Sea, its length is almost three times its width. As it stretches from north to south, the width of its terrain becomes narrower. Lebanon's mountainous terrain, and the economic and religious movements that either originated in the region or crossed through to leave an imprint upon Lebanese society, give form to the country's history. The Anti-Lebanon Mountains are a southwest-northeast-trending mountain range that forms most of the border between Syria and Lebanon. The border is largely defined along the crest of the range. Most of the range lies in Syria. The Barada is the main river of Damascus, the capital city of Syria. Tartus Governorate is one of the fourteen governorates (provinces) of Syria. It is situated in western Syria, bordering Lebanon to the south, the Mediterranean Sea to the west, Latakia Governorate to the north, and Homs and Hama Governorates to the east. 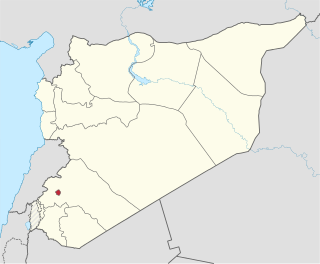 It is one of the few governorates in Syria that has an Alawite majority. Sources list the area as 1,890 km² or 1,892 km². The governorate has a population of 785,000. The capital is Tartus. Latakia Governorate is one of the fourteen governorates (provinces) of Syria. It is situated in western Syria, bordering Turkey. Its reported area varies in different sources from 2,297 km² to 2,437 km². The governorate has a population of 991,000. Members of the Alawite sect form a majority in the governorate, although Armenians, Turkmen, and Sunni Kurds form the majorities in the Kessab, Jabal Turkman, and Jabal al-Akrad regions respectively. The capital of Latakia had, by 2010 estimates, 400,000 inhabitants, 50% of whom were Alawites, 30% were Sunni, and 20% Christian. Marmarita is a village in northwestern Syria, located west of Homs. Marmarita is one of the largest villages in Wadi al-Nasara, a region north of Talkalakh. In 2004, Marmarita had a population of 2,206, according to the Central Bureau of Statistics (CBS). Its inhabitants are predominantly Greek Orthodox Christians and is one of the largest Christian villages in the Wadi al-Nasara. Marmarita is a popular summer destination and tourist attraction in Syria. The village has been part of the Homs Governorate since 1953; prior to that, it was part of the Latakia Governorate. 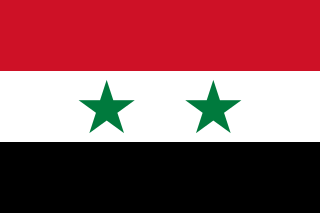 Damascus Governorate is one of the fourteen governorates (provinces) of Syria. Completely surrounded by the Rif Dimashq Governorate, it consists only of the city of Damascus, the capital of Syria, and the suburb of Yarmouk Camp. 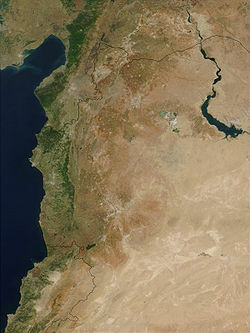 The Homs Gap is a relatively flat passage in the Orontes River Valley of southern Syria. Nicknamed the "gateway to Syria," the gap separates the An-Nusayriyah Mountains and Jabal Zawiya from the Lebanon and Anti-Lebanon mountains. The small Nahr al-Kabir river runs down the Gap to the Syrian coast to the Mediterranean Sea. The Coastal Mountain Range is a mountain range in northwestern Syria running north-south, parallel to the coastal plain. The mountains have an average width of 32 kilometres (20 mi), and their average peak elevation is just over 1,200 metres (3,900 ft) with the highest peak, Nabi Yunis, reaching 1,562 metres (5,125 ft), east of Latakia. In the north the average height declines to 900 metres (3,000 ft), and to 600 metres (2,000 ft) in the south. Water resources management in Syria is confronted with numerous challenges. First, all of the country's major rivers are shared with neighboring countries, and Syria depends to a large extent on the inflow of water from Turkey through the Euphrates and its tributaries. Second, high population growth and urbanisation increase the pressure on water resources, resulting in localized groundwater depletion and pollution, for example in the Ghouta near Damascus. Third, there is no legal framework for integrated water resources management. Finally, the institutions in charge of water resources management are weak, being both highly centralized and fragmented between sectors, and they often lack the power to enforce regulations. Water resources policies have been focused on the construction of dams, the development of irrigated agriculture and occasional interbasin transfers, such as a pipeline to supply drinking water to Aleppo from the Euphrates. There are 165 dams in Syria with a total storage capacity of 19.6 km³. Demand management through metering, higher tariffs, more efficient irrigation technologies and the reduction of non-revenue water in drinking water supply has received less emphasis than supply management. The government implements a large program for the construction of wastewater treatment plants including the use of reclaimed water for irrigation. Aleppo plateau is a low, gently undulating plateau of northern Syria. It lies at the northern end of the junction between the Arabian Plate and the African Plate at the Dead Sea Rift. The plateau lies mostly in the Aleppo Governorate and Idlib Governorate. Aleppo is located in the north-center of the plateau.